Posted by cath in general info, Info and Cooks Notes, ingredients, shopping notes. Go on! Try something fairtrade this fortnight…or any fortnight! This is my review of fairtrade goodies. The list is evolving as I try and test fairtrade stuff available from local shops in my area. I’ve also tried Ben&Jerrys – this one also uses fairtrade sugar and vanilla, they also use free range eggs in their products which is reassuring. Again, a good quality ice-cream and a little easier to find in the shops from this popular brand name. Dubble Speckled Eggs – finally an ethical mini egg. The good news is that it tastes great, and with fairtrade vanilla, sugar and chocolate it is good too! I’ve seen them in the One World Shop, also in Oxfam shops around the country. Yes, there is an alternative to Pepsi and Coca Cola…and it is Ubuntu cola (not to be mistaken for the Linux distribution of the same name!*). You can buy it in the One World Shop up here in Edinburgh, it is a very tasty cola made with fairtrade sugar (they state they are also going to try to source fairtrade caffeine from the fairtrade coffee industry which is interesting too). Check out the Ubuntu-Trading Website for more info and stockists in your area. I’ve tried a couple of brands of fairtrade vanilla pods (Barts Spices and Ndali) and have recently tried the Ndali Vanilla Extract. This has been quite useful in brownie making – and is a lot less hassle than the pods. The extract is very different to the synthetic vanilla flavours I remember from years ago, and definitely worth a try if your a fan of vanilla. Cafe-direct now does a massive range of coffee and more products besides. Scotmid (or the Co-op) also has a full range of coffee and chocolate, also much much more, check out their website for more details. We’ve always found it hard to get good espresso coffee to make at home, but can recommend Clipper Espresso (with the picture of the Three Graces on the front). 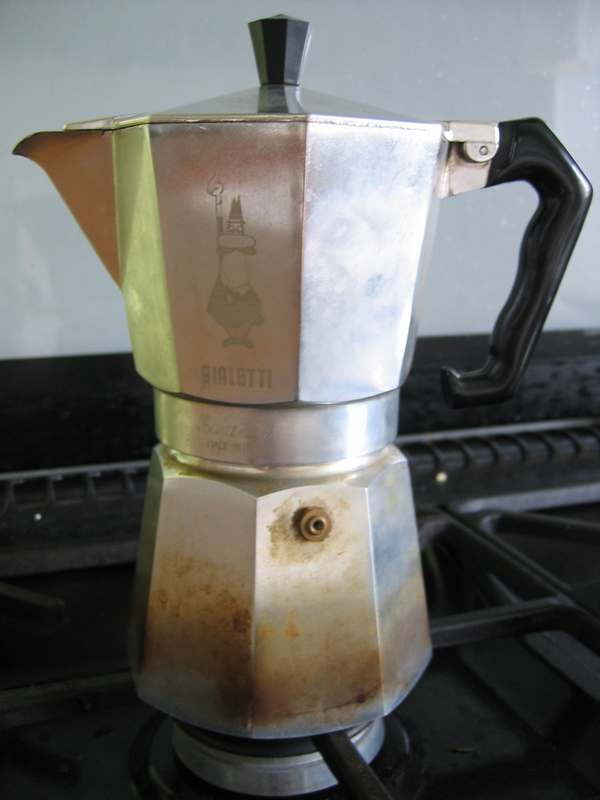 Great for use in your stove-top coffee pot. 6. Fairtrade Cooked & Canned Beans! No, I’m not talking about baked beans! (but I can recommend Scotmid Organic Baked Beans, although presently they are not fairtrade). These are Aduki Beans – a small, red bean – nutty and delicious. Particularly good as a meat substitute in vegetarian dishes like cottage pie etc. I’ve just made a vegetable and bean chilli con carne with Suma Organic, Fairtrade Aduki Beans, Black Eye & Kidney beans too, with lots of veg. The tinned beans are pre-cooked so they are very quick and easy to use. They don’t require lots of soaking/blanching etc. Best of all, they are now fairly traded. 7. Fairtrade Bananas – Let them loose! I would love to eat more fairtrade bananas, but I have a problem buying the plastic packs of 7 or so bananas ubiquitously available in the supermarkets today. I don’t want 7 bananas, sometimes I just want one for lunch or as a healthy afternoon snack. Well, during fairtrade fortnight, I went in search of the humble loose fairtrade banana, with very little luck I’m afraid. I asked at several local shops who had the fairtrade poster up, but their bananas were not fairtrade! But I did find small packets of bananas in my local Scotmid – I got a pack of three for 54p – good value, but why the plastic packaging I wonder? Quite unexpectedly I finally found the illusive loose fairtrade banana in my local Margiotta (a local chain of shops in Edinburgh) in Marchmont. The price was higher than Scotmid, but I was able to buy two individual (not plastic wrapped) fairtrade (with the mark on a sticker) bananas for 55p. Come on shops – lets see more of this please! Fairtrade oranges and citrus fruits have been in my local Scotmid, and some other supermarkets for a while now, but this fortnight I’ve been looking for more options. I’ve tried fairtrade grapes from Marks & Spencers this week, they were very nice, and good value due to being half-price (I expect that was just for fairtrade fortnight though!). Other good ones to look out for are pineapple, mango and avocado – available from a lot of supermarkets, and some local organic stores. Nowadays you can buy a lot of different sugars, granulated, white, soft brown etc. Sadly I’ve not yet found any icing sugar for my brownie mix, so I’ll keep looking. Make sure your sugar bowl is full of fairtrade! OK so it’s not food, but check out the increasing availability of fairtrade cotton for your clothes. I love People Tree and the One World Shop…but there is a lot more to choose from nowadays. There is a lot more information on Fairtrade including product listings and brands. Check out the Fairtrade Website for more details.